What is it about the Willows and pink flamingos? 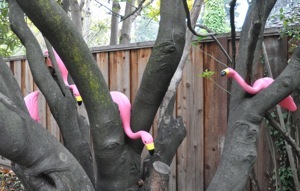 The first flock appeared a couple of years ago at the 101 end of the Menlo Park neighborhood. After making their way from house to house over a period of a couple of months, they retired from service. Now there are two new flocks. The smaller of the two, which includes baby flamingos, is in the area of Laurel and Grayson. A bigger flock of 40 flamingos, the creation of artist S2, is on Laurel west of Gilbert. “I got them free from recycle and they’re fun to play with,” he says about the flock that made its first appearance last summer. Most of the time S2 uses all 40 in his front yard installations. “I shrunk them down to just three for “A Day Without Art” [World AIDS Day] (pictured top). I try to deal with themes from the world at large but sometimes it’s just something whimsical. My goal is to do something new two times a week but that doesn’t always happen. Note: The long line of flamingos (center) is going through a TSA scanner with three birds pausing to read that they’re on the suspect list. What a few flamingos are doing in the tree we’re not sure! Brilliant ! I’ve been wondering about the genius behind this! Five Stars! congratulations. the flamingos are a force unto themselves. Love it! Great creativity. Thanks for the share!